Posted on 24th January 2019 at 9:25 pm. 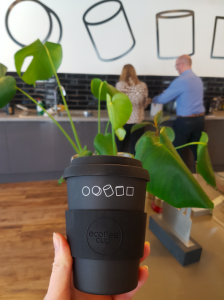 They are a great environmentally friendly alternative to plastic reusable coffee cups. Natural bamboo fibre is a great material and one of the world’s most sustainable resources. Cups are manufactured in a variety of different sizes infusing 16oz and 20oz Cups. The Bamboo Coffee Cups are light, sturdy and fully dishwasher safe. It also has a resealable ‘no-drip’ lid. These cups are not suitable for microwaves. Bamboo is very sustainable – it can grow a metre a day, meaning that growers have a fast renewing source of materials. Minimal heat is used during the production process. Our cups are dishwasher safe but cannot be microwaved. Who Buys Re-usable Coffee Cups? Often supplied to Universities, Coffee Shops and many Companies whom give them to staff or customers as corporate gifts. Bamboo Coffee Cups are a great alternative to traditional re-usable coffee cups. Cups are available in lots of varieties of coloured lids, cups and silicone lids and can be custom printed to the Sleeve or in multiple positions on the cup. Where can I buy see some? Many people have viewed these coffee cups and come up with some amazing designs, all can be printed in many different ways, have look and let you imagination run wild.